Hanoi (VNA) – National flag carrier Vietnam Airlines and low-cost airline Jetstar Pacific continued to cancel flights between Japan’s Osaka and Vietnam scheduled for September 6 after tropical storm Jebi struck the west of Japan, flooding Kansai International Airport. Vietnam Airlines will cancel four more flights (VN330, VN331, VND320, and VN321) from Hanoi and Ho Chi Minh City to Osaka and vice versa as Kansai International Airport will remain closed until at least 3pm on September 6. The carrier has cancelled a total of 12 flights so far since September 4 due to the temporary shutdown of the Osaka-based airport. It will allow passengers affected by the cancellation of the flights to reroute their travel to Nagoya, Narita, and Haneda Airports in Tokyo or Fukuoka Airport free of charge by request. In addition, it plans to use wide-body Boeing 787 aircraft for the replacement flights, which offer more seats than the Airbus A321 currently used on the routes between Nagoya and Vietnam’s Hanoi or HCM City. Further information can be found on the websites www.vietnamairlines.com or www.facebook.com/VietnamAirlines, Vietnam Airlines’ ticket agents nationwide, or the hotline 19001100. Jetstar Pacific also announced it will suspend services to/from Osaka until the end of September 6. 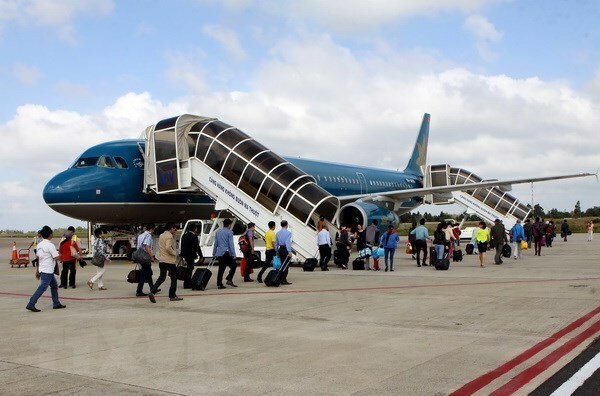 The budget airline will still be cancelling four flights, BL620 and BL621 between Hanoi and Osaka and BL164 and BL165 connecting Da Nang and Osaka on September 5-6. Passengers can keep track of updates or seek support via Jetstar Pacific’s hotline 19001550. Typhoon Jebi, the most powerful storm to hit Japan in 25 years, inundated runways at one of the country’s largest airports – Kansai International Airport in Izumisano, Osaka which was built on a man-made island. Furthermore, a tanker smashed into the only bridge linking Kansai airport with the mainland, causing serious damage. Hundreds of flights to/from Kansai International Airport have been cancelled because of the storm. Japan’s All Nippon Airways (ANA) has cancelled 247 domestic and eight international flights, while Japan Airlines did the same with 176 domestic flights.